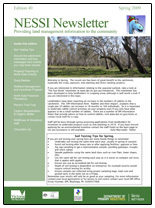 The North East Salinity Strategy Implementation (NESSI) Newsletter was first published in the winter of 1999, for distribution to landholders in salinity priority areas in region. The newsletter aimed to keep landholders informed about activities that were under way to reduce the impacts of dryland salinity in the region. 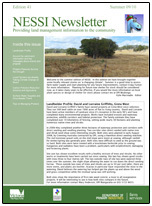 In more recent years the newsletter has expanded to include information on wider topics of land and biodiversity management. The newsletter is now distributed to 4600 landholders through roadside delivery and to hundreds of other landholders and agency staff via email. The name has also changed to the North East Sustainability and Science Information Newsletter: providing land management information to the community.